1. Verifique las calificaciones del preparador. Todos los preparadores de impuestos pagados están obligados a tener un número de identificación de preparador de impuestos (PTIN por sus siglas en inglés). El IRS pronto ofrecerá un nuevo directorio de Preparadores de Impuestos Federal con Credenciales y Calificaciones Seleccionadas en IRS.gov. Usted podrá usar esta herramienta para ayudarle a encontrar un preparador de impuestos con los requisitos que usted prefiera. El directorio será un listado conveniente de búsquedas de algunos preparadores con un PTIN válido para el año 2015. Este incluirá el nombre, ciudad, estado y código postal de: Abogados, CPAs, Agentes Registrados, Agentes Registrados de Plan de Jubilación, Actuarios Registrados, Participantes del Programa de Temporada de Presentación Annual. 2. Corrobore el historial del preparador. Se puede comprobar con el Buró de Mejores Negocios (BBB por sus siglas en inglés) para averiguar si un preparador tiene antecedentes cuestionables. Indague sobre las reprimendas disciplinarias y la condición de la licencia de los preparadores registrados. Para contadores públicos certificados, consulte con la Junta Estatal de Contabilidad. Para abogados, contacte a la Barra de Abogados del Estado. Para agentes registrados, visite IRS.gov y busque “verify enrolled agent status” (en inglés). 3. Pregunte sobre los honorarios de servicio. Evite a los preparadores que basan sus honorarios en un porcentaje de su reembolso o aquellos que dicen pueden obtener reembolsos más grandes que otros. Siempre asegúrese de que cualquier reembolso se le envíe a usted o sea depositado en su cuenta bancaria. No permita que su reembolso sea depositado en la cuenta bancaria del preparador. 4. Pida enviar su declaración por e-file. Asegúrese que su preparador ofrece e-file del IRS. Cualquier preparador remunerado que prepara y presenta más de 10 declaraciones generalmente debe mandar electrónicamente las declaraciones de sus clients. 5. Asegúrese de que el preparador esté disponible. Usted necesita asegurarse de que puede comunicarse con el preparador de impuestos después de presentar su declaración. Eso es cierto incluso después del 15 de abril. Puede que necesite comunicarse con el preparador si surgen preguntas acerca de su declaración de impuestos en un momento posterior. 6. Proporcione los registros de impuestos. Un buen preparador le pedirá ver sus registros y recibos. Ellos le harán preguntas para que reporte todos sus ingresos y los beneficios fiscales que le corresponden. Estos pueden incluir deducciones, créditos fiscales y demás. No contrate a un preparador que esté dispuesto a presentar su declaración de impuestos electrónicamente usando el último talón de cheque en lugar de su formulario W-2. Esto va contra las reglas de e-file del IRS. 7. Nunca firmar una declaración de impuestos en blanco. No use a un preparador de impuestos que le pide que firme un formulario de impuesto en blanco. 8. Revise su declaración antes de firmar. Antes de firmar su declaración de impuestos, revísela cuidadosamente. Haga preguntas si algo no está claro. Asegúrese de que se siente cómodo con la información sobre la declaración antes de firmarla. 9. Preparador debe firmar e incluir su PTIN. Preparadores de paga deben firmar planillas e incluir su PTIN como exige la ley. El preparador también debe darle una copia de la declaración. 10. Reporte a los preparadores de impuestos abusivos al IRS. Puede denunciar a los preparadores de impuestos abusivos y sospechosos de fraude fiscal ante el IRS. Use el Formulario 14157, Denuncia: Preparador de Impuestos. Si sospecha que un preparador presentó o cambió su declaración sin su consentimiento, también debería presentar Formulario 14157-A, Declaración Jurada de Mala Conducta del Preparado. Usted puede descargar e imprimir estos formularios en IRS.gov. Check the preparer’s qualifications. All paid tax preparers are required to have a Preparer Tax Identification Number or PTIN. The IRS will soon offer a new Directory of Federal Tax Return Preparers with Credentials and Select Qualifications on IRS.gov. You will be able to use this tool to help you find a tax return preparer with the qualifications that you prefer. The Directory will be a searchable and sortable listing of certain preparers with a valid PTIN for 2015. It will include the name, city, state and zip code of attorneys, CPAs, Enrolled Agents, Enrolled Retirement Plan Agents, Enrolled Actuaries, Annual Filing Season Program participants. Ask about service fees. Avoid preparers who base their fee on a percentage of your refund or those who say they can get larger refunds than others can. Always make sure any refund due is sent to you or deposited into your bank account. You should not have your refund deposited into a preparer’s bank account. Ask to e-file your return. Make sure your preparer offers IRS e-file. Any paid preparer who prepares and files more than 10 returns generally must e-file their clients’ returns. The IRS has safely processed more than 1.3 billion e-filed tax returns. Make sure the preparer is available. You need to ensure that you can contact the tax preparer after you file your return. That’s true even after the April 15 due date. You may need to contact the preparer if questions come up about your tax return at a later time. Provide tax records. A good preparer will ask to see your records and receipts. They ask you questions to report your total income and the tax benefits you’re entitled to claim. These may include tax deductions, tax credits and other items. Do not use a preparer who is willing to e-file your return using your last pay stub instead of your Form W-2. This is against IRS e-file rules. Never sign a blank tax return. Do not use a tax preparer who asks you to sign a blank tax form. Review your return before signing. Before you sign your tax return, review it thoroughly. Ask questions if something is not clear to you. Make sure you’re comfortable with the information on the return before you sign it. Preparer must sign and include their PTIN. Paid preparers must sign returns and include their PTIN as required by law. The preparer must also give you a copy of the return. Report abusive tax preparers to the IRS. You can report abusive tax preparers and suspected tax fraud to the IRS. Use Form 14157, Complaint: Tax Return Preparer. If you suspect a return preparer filed or changed the return without your consent, you should also file Form 14157-A, Return Preparer Fraud or Misconduct Affidavit. 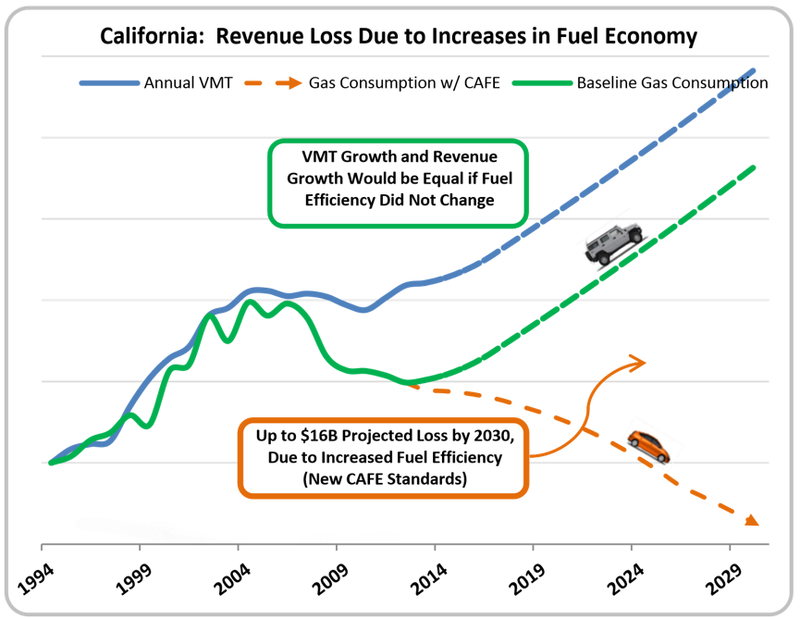 This is Part 3 of “Exploring a Road Usage Charge as an Alternative to the Gasoline Tax” released by CalSTA (California State Transportation Agency). Implementation of a road usage charge to replace the antiquated per-gallon excise tax would help to preserve transportation revenues for state and local governments. However, as highlighted by the experience in Oregon, the process to implement a road usage charge is long and challenging. A demonstration program will provide data to inform the conversation regarding a road usage charge as a viable user fee option for California and test participant reactions to the concept. The state should pursue a demonstration program to understand the challenges and best practices associated with a road usage charge program. A conversion from a gasoline excise tax to a road usage charge would be an extensive process that would take considerable time. Exploration of the issues discussed above would enable the state to explore an important option for transportation funding without necessitating a change to the current tax structure, or to current statute. The state of Oregon has been a national leader in the drive towards a road usage charge. It is currently the only state in the nation that has a permanent, albeit limited, road usage charge. Oregon started on this path in 2001, when the Oregon Legislature created Oregon’s Road User Fee Task Force (Task Force). The Task Force was created to develop a revenue collection design funded through user pay methods, acceptable and visible to the public, that ensures a flow of revenue sufficient to annually maintain, preserve and improve Oregon’s state, county and city highway and road system. The Task Force researched and investigated more than two-dozen revenue options. After the Task Force determined that a road user fee based on miles driven had the most promise, it spearheaded a successful pilot in the Portland area that concluded in 2007. That 2007 pilot proved the concept of a per-mile fee was feasible and pinpointed areas that needed more research and testing. In 2012, the Oregon Department of Transportation (ODOT) began a second road user fee pilot. The second pilot included new technologies that could report VMT without the use of a global positioning system (GPS), assuaging many privacy concerns. Notably, the second pilot gave volunteers several options, including the type of device used, and a choice of service provider. The pilot concluded in February 2013, and was the final proof of concept necessary to move forward into formal implementation. A 2013 bill (Senate Bill 810) authorized the ODOT to set up a permanent road usage charge system for 5,000 volunteer motorists beginning July 1, 2015. ODOT may assess a charge of 1.5 cents per mile for up to 5,000 volunteer cars and light commercial vehicles and issue a gas tax refund to those participants. Washington and other western states are exploring a road usage charge and have formed the Western Road Usage Charge Consortium to collaborate and pool valuable research and development dollars. The word “sustainability” generally evokes thoughts related environmental quality. But sustainability is a much broader concept that includes, at its heart, a consideration for the long-term feasibility of any undertaking, including its financial feasibility. As currently structured and with advances in vehicle technologies, the current per-gallon tax on fuel is not sustainable as a long-term revenue source for transportation infrastructure funding. Therefore, California should consider the feasibility of other revenue sources. The road usage charge is untested on a large scale in the United States, but may offer benefits as an alternative to the gasoline tax in terms of greater revenue sustainability to maintain bridges, roads and other transportation infrastructure; and in terms of a closer nexus between the payer and the service being consumed. A closer nexus between a road usage charge and miles traveled on roads and highways may additionally improve traveler information about the relative costs of car travel compared to other modes. Better consumer information on the cost of car trips may increase car pools, transit, and active transportation modes; resulting in co-benefits to the environment and public health. When the possible benefits of a road usage charge detailed in the prior paragraph are coupled with the need to consider various options for privacy protection, technology, and other detail of a road usage charge system, the merit of a demonstration program comes into focus. This whitepaper does not recommend implementation of a road usage charge – rather it recommends exploration, through a demonstration program, to better understand the possible benefits and costs. Through future efforts, the CTIP Workgroup will additionally be looking at other pay-as-you-go revenue options to maintain transportation infrastructure. This is Part 1 of “Exploring a Road Usage Charge as an Alternative to the Gasoline Tax” released by CalSTA (California State Transportation Agency). New Corporate Average Fuel Economy (CAFE) standards, alternative fuels, and the rise in the popularity of electric vehicles, combine to create a rapidly deteriorating funding situation. These are positive results from other statewide policy initiatives, but the primary state transportation revenue source for maintenance and operations has been the flat-rate excise tax of 18 cents placed on each gallon of gasoline sold. While sales tax (later replaced with a “price-based” excise tax) was shifted to transportation beginning in 2000, only the base 18 cents provides funding for “fix-it-first” activities including maintenance and rehabilitation of the state’s transportation system. The excise tax has long been used as a proxy for a user fee, but as vehicles become more efficient, this proxy is becoming less effective. The emphasis on increased fuel economy is undeniably desirable. From an environmental and energy policy standpoint, decreased fuel consumption reduces greenhouse gasses and our dependence on a finite energy source. However, as we strive to reduce fuel consumption, we undercut the primary funding source for repair of the roads that all cars, trucks, and busses rely on – regardless of the energy source that they use, or how efficient the vehicle they drive is. There is no equitable means to mitigate these effects so long as we continue to rely on the antiquated per-gallon excise tax. By 2030, as much as half of the revenue that could have been collected will be lost to fuel efficiency. If that sounds farfetched, consider that 20 years ago in 1994, the average fuel economy of cars on the road in the United States was just around 20 miles per gallon (MPG); today the average efficiency of new cars sold exceeds 35 MPG. By comparison, 35 MPG was the average fuel economy of all passenger cars sold in the European Union (EU) in 2001, and by 2011 it had increased to 42 MPG, with average highway ratings exceeding 50 MPG. As new, more efficient, cars replace the older models, the effect on consumption and average fuel economy of the fleet will increase rapidly. On the other hand, revenue from the gas tax will decline dramatically. Estimates suggest that the decrease in revenue due to fuel efficiency will soon outpace even the negative impact of inflation. Complicating the issue somewhat is the interaction of increased fuel economy with the use of diesel fuel that is taxed at a lower rate than gasoline. The market share of diesel passenger vehicles in the United States is currently around 1 percent. Based on experiences in the 1980s drivers in the United States have been soured on diesel cars, viewing them as noisy, dirty, and unreliable. But modern diesel systems are touted as clean, powerful, and fuel-efficient. In the EU, 55 percent of passenger cars sold in 2011 were diesel-powered. Because modern diesel cars are more fuel efficient than gasoline-powered equivalents, this move to diesel power has helped the EU to achieve outstanding average fuel efficiency and commensurate greenhouse gas reductions. Recent years have seen the marginally successful re-entry of diesel passenger cars into the United States market, and estimates by some expert sources indicate that the market share of new diesel passenger cars sold could increase to 10 percent by 2020. But, because diesel excise tax was reduced to 10 cents per gallon (from 18), a shift in fuel source would negatively impact transportation revenues available under the existing tax structure. Even absent changes in tax revenue due to fuel efficiency, the state faces another losing proposition in the excise tax: inflation. The base excise tax, which provides the funding for the maintenance of our highways and local roads, has remained unchanged since 1994. This rate has been in place for 20 years, despite significant increases in project construction costs. Since that time, despite the economic crisis of 2008, the buying power of the tax has decreased about 42 percent in terms of construction costs. To flip that around, if the base 18 cents-per gallon tax had been indexed to inflation back in 1994, it would be about 31 cents per-gallon today. The chart above illustrates how inflation has reduced the purchasing power of 1994’s 18 cent gas excise tax to the equivalent of a 10.5 cent tax. A further adjustment for increased VMT would reduce the purchasing power to the equivalent of 9.0 cents per gallon (half the value). The effects of inflation must be addressed if California is to be successful in both improving the condition of transportation infrastructure and maintaining the improved condition. The means of doing so is tie the tax to an index that changes with the cost of goods and services. The Consumer Price Index may be the most well known, but the Producer Price Index, or even the California Highway Construction Cost Index are more consistent with construction price changes. 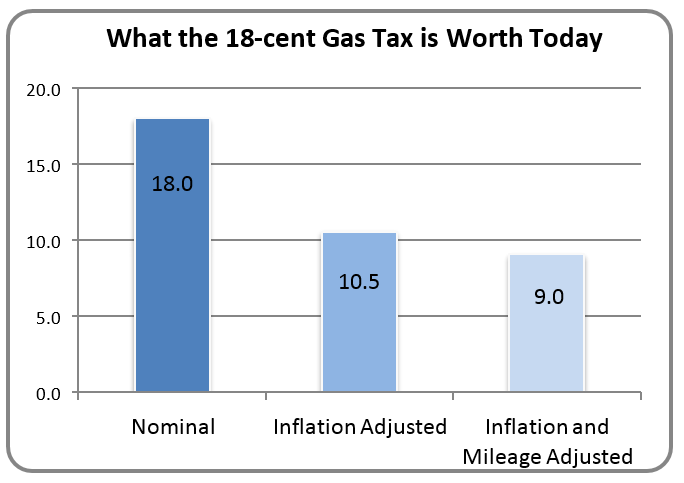 The gasoline excise tax was raised multiple times between its initiation in 1923 and the last increase in 1994 to account for the effects of inflation. Indexing annually for inflation can alternatively be authorized and reduces the purchasing power erosion between longer-term adjustments. Regardless of the type of long-term solution implemented to provide appropriate funding for transportation, the effects of inflation must be surmounted and annual indexing considered. Gas taxes pay for highways, local roads, bridges, busses, trains, and even active transportation. However, the current per-gallon tax structure is untenable in the long-term as fuel efficiency increases. Although total Vehicle Miles Traveled (VMT) are expected to increase over time, the projected sale of gasoline is expected to decrease dramatically due to increasing fuel efficiency of the vehicle fleet. One alternative funding approach to this problem is a Road Usage Charge, which is charged on the number of vehicle miles traveled. This may be a more logical and fairer method of paying for state highway needs in light of high fuel economy and electric drive vehicles. It is also a direct charge for usage of the transportation system with a clearer nexus between payment and use. As a new and widely untested alternative funding approach, many questions must be answered prior to any wide-scale changes. This whitepaper describes the need for a stable revenue source that will address the twin funding problems of inflation and increasing vehicle fuel economy, and some of the challenges therein. With perhaps the notable exception of Warren Buffett, nobody publicly admits to wanting to pay more taxes. Nonetheless, the state’s transportation infrastructure represents an essential component of modern life, and its existence and function relies on some sort of user payment. The transport of people, food, and consumer goods – not to mention vital emergency services – would not be possible without the state’s integrated transportation system. Though no official number exists, it is roughly estimated that the transportation system in the state is valued in the neighborhood of several trillion dollars; yet users of the system generally pay far less for use of the system than for many daily luxuries. The average driver pays just $368 annually in gasoline taxes, including all state, local and federal taxes. 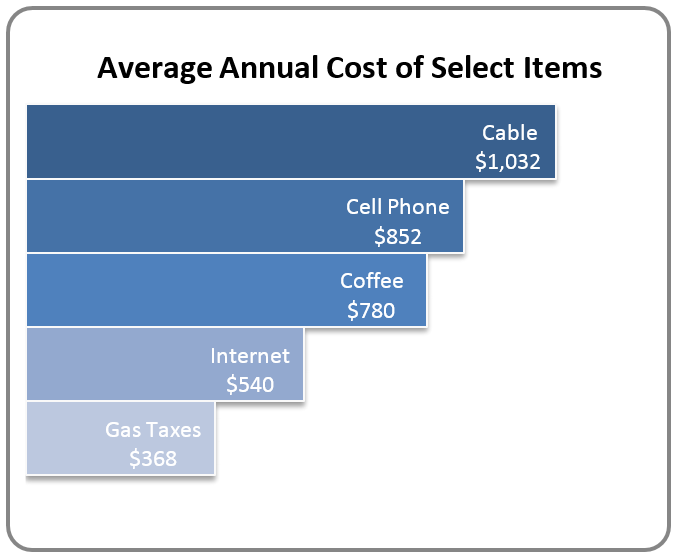 Yet, consumers would likely be surprised to find that their annualized payments for use of highways and roads are only about one-third of the cost of their cable bill. This lack of perspective makes it very difficult to engage in any conversation about paying for infrastructure. The current tax system is a consumption tax. It is constructed in such a way that leads consumers to think of the taxes on gasoline as a tax for the purchase of gasoline, not on the usage of the roadway network. This somewhat circular logic is perpetuated by the fact that the taxes on gasoline are just a proxy for a tax on the use of the transportation system. The direct link between use of the system and paying for that system does not exist. A useful means of guiding this discussion is to shift the focus from a tax, to a charge for use of a crucial utility, just as people think about their use of electricity, water and internet access. What Are Premium Tax Credits for your Health Insurance? If you bought health insurance through the Health Insurance Marketplace in 2014, you may be eligible for the new Premium Tax Credit. You will need to file a return to claim the credit. If you purchased coverage from the Marketplace in 2014 and chose to have advance payments of the premium tax credit sent directly to your insurer during the year you must file a federal tax return. You will reconcile any advance payments with the allowable Premium Tax Credit. Your Marketplace will provide Form 1095-A, Health Insurance Marketplace Statement, to you by Jan. 31, 2015, containing information that will help you file your tax return. Note: You can’t use Form 1040EZ to claim this Premium Tax Credit or if you received advance payments of this credit in 2014. If you qualify for an exemption, you will need to complete the new IRS Form 8965, Health Coverage Exemptions, when you file your tax return. You must apply for some exemptions through the Health Care Insurance Marketplace. However, most of the exemptions are easily obtained from the IRS when you file your tax return. Some of the exemptions are available from either the Marketplace or the IRS. If you receive an exemption through the Marketplace, you’ll receive an Exemption Certificate Number to include when you file your taxes. If you have applied for an exemption through the Marketplace and are still waiting for a response, you can put “pending” on your tax return where you would normally put your Exemption Certificate Number. El IRS (Servicio de Impuestos Internos) ha visto un aumento de estas estafas telefónicas en los últimos meses de los estafadores que amenazan con arrestos de la policía, deportación, revocación de la licencia y otras cosas. El IRS recuerda a los contribuyentes que estén al acecho para protegerse contra todo tipo de estafas que surgen durante cualquier temporada de impuestos. “Si alguien llama inesperadamente pretendiendo ser del IRS con amenazas agresivas si no paga de inmediato, le está llamando un estafador”, dijo John Koskinen, Comisionado del IRS. El primer contacto del IRS con los contribuyentes es generalmente a través del correo. Las estafas telefónicas encabezan la lista este año porque ha sido un problema persistente y penetrante para muchos contribuyentes durante muchos meses. Los estafadores son capaces de alterar los números de identificación de llamadas para que parezca que el IRS está llamando. Usan nombres y números de placa falsos del IRS. A menudo dejan mensajes de carácter “urgente”. Se aprovechan de las personas más vulnerables, como los inmigrantes recién llegados, ancianos y aquellos cuyo primer idioma no es inglés. Los estafadores saben también cómo hacerse pasar por agentes del Departamento de Investigación Criminal del IRS. Los estafadores en sus llamadas pueden exigir dinero o decirle que a usted le corresponde un reembolso e intentar engañarlo para que comparta información privada. Estos estafadores pueden sonar convincentes cuando llaman. Puede que sepan mucho sobre usted. El IRS recuerda a las personas que pueden saber muy fácilmente cuando una supuesta llamada del IRS es falsa. Aquí hay cinco cosas que los estafadores a menudo lo hacen pero no lo hará el IRS. Cualquiera de estas cinco cosas es un signo revelador de una estafa. Llamará exigiendo pago inmediato, ni la agencia llamará sobre impuestos adeudados sin antes haber enviado una facture. Exigirá que pague impuestos sin darle la oportunidad de cuestionar o apelar la cantidad que dicen que adeuda. Exigirá que use un método de pago específico para sus impuestos, como una tarjeta de débito prepagada. Le preguntará por los números de tarjetas de crédito o débito por teléfono. Lo amenazará con llamar a la policía local u otros grupos policiacos para arrestarlo por no pagar. Si sabe que debe impuestos o cree que debe, llame al IRS al 1-800-829-1040. Los representantes del IRS pueden ayudarle con el asunto de pago. Si sabe que no debe impuestos y no tiene ninguna razón para creer que usted adeuda impuestos, reporte el incidente a TIGTA al 1-800-366-4484. “If someone calls unexpectedly claiming to be from the IRS with aggressive threats if you don’t pay immediately, it’s a scam artist calling,” said IRS Commissioner John Koskinen. The first IRS contact with taxpayers is usually through the mail. During filing season there’s a surge of phone scams as scam artists threaten police arrest, deportation, license revocation and other things. Phone scams top the list because scammers are able to alter caller ID numbers to make it look like the IRS is calling. They use fake names and bogus IRS badge numbers. They often leave “urgent” callback requests. They prey on the most vulnerable people, such as the elderly, newly arrived immigrants and those whose first language is not English. Scammers have been known to impersonate agents from IRS Criminal Investigation as well. As telephone scams continue across the country, the IRS recently put out a new YouTube video with a renewed warning to taxpayers not to be fooled by imposters posing as tax agency representatives. If you know you don’t owe taxes or have no reason to believe that you do, report the incident to the TIGTA at 1-800-366-4484 or at http://www.tigta.gov. Exacta y fácil.IRS e-file es la mejor manera de presentar una declaración de impuestos precisa. El software de impuestos que usa para e-file ayuda a evitar errores al hacer por usted los cálculos matemáticos. Lo guía paso a paso mientras hace sus impuestos. E-file del IRS también puede ayudar con las nuevas disposiciones de la Ley de Cuidado de Salud a Bajo Precio. En resumidas cuentas es que e-file es mucho más fácil que hacer su declaración de impuestos a mano y enviar los formularios de impuestos de papel. Opciones convenientes.Puede comprar el software comercial de impuestos para e-file o pregunte a su preparador de impuestos que presente electrónicamente su declaración de impuestos. También puede hacerlo electrónicamente a través de IRS Free File, el programa e-file sólo disponible en IRS.gov de preparación de impuestos gratis. Usted puede calificar para presentar su declaración de impuestos a través de los Programas de Asistencia Voluntaria de Impuestos del IRS o Consejería de Impuestos para Personas de la Tercera Edad. En general, VITA ofrece ayuda con la preparación de impuestos si ganó $53,000 o menos. TCE ofrece ayuda principalmente a personas mayores de 60 años. Seguro y protegido. E-file del IRS cumple con normas estrictas y usa tecnología de encriptación segura para proteger su declaración de impuestos. El IRS ha procesado más de 1.3 mil millones de declaraciones de impuestos de forma segura presentadas electrónicamente desde que comenzó el programa. Reembolsos más rápidos. En la mayoría de los casos puede recibir su reembolso más rápido al presentar electrónicamente. Esto se debe a que el reembolso llega más rápido porque no hay nada que enviar por correo y su declaración de impuestas está prácticamente libre de errores. La forma más rápida de obtener su reembolso es combinar la presentación electrónica con el depósito directo en su cuenta bancaria. El IRS emite la mayoría de los reembolsos en menos de 21 días. Facilidades de pago. Si debe impuestos, puede presentar por e-file y establecer una fecha de pago automático en cualquier momento en o antes del 15 de abril. Usted puede pagar electrónicamente desde su cuenta bancaria. También lo puede hacer con cheque o giro postal o con tarjeta de crédito o débito. Para más información, visite IRS.gov/payments. Si le parece este consejo tributario útil, por favor compártalo a través de sus plataformas de medios sociales. Una manera fantástica de obtener información sobre los impuestos es usando los medios sociales del IRS. También puede subscribirse a los Consejos Tributarios del IRS o cualquiera de nuestros e-news subscriptions.